This is a concise survey and criticism of Goethe's work, for the general reader and the student. It is intended as a useful first book from which the reader can proceed to more specialised studies. Here Goethe's work is seen as a whole, and from the point of view of literary criticism. 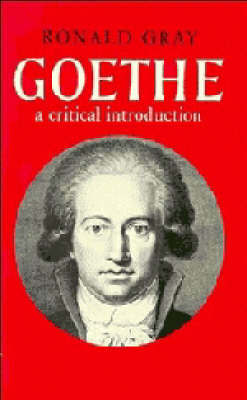 The first chapter summarises Goethe's life. The other chapter discuss the works, singly and in groups. Much attention is given to the poems; and there are two long chapters on Faust. Werther, Wilhelm Meister, Elective Affinities, and the Divan are given a chapter each; so are the dramatic works, the autobiographical writings, and the scientific work. A refreshing aspect of the book is that while Dr Gray takes account of earlier criticism he also seeks to see Goethe's work entirely afresh, and to reappraise it; by questioning the value of some works, he enhances the valuation of others. Quotation is in German, but English translations are given in footnotes. There is a useful comparative table of biographical dates, which shows what was happening, politically and culturally, in Europe while Goethe lived. There are references at the end of the book, a select bibliography and an index. The book can be used in conjunction with Dr Gray's selection of the poems. The two books together are the best possible introduction to one the greatest European men of letters.